Have you ever marvelled at the skills of ACTION bus drivers as they navigate their unwieldy buses around tight suburban streets? From 1991 until 2006, ACTION's top drivers had the opportunity to put their driving skills to the test against the nation's top bus drivers at the annual National Bus Roadeo. Judges rate drivers on technique and passenger comfort with points deducted for each marker hit during an obstacle course. The driver who finishes the roadeo with the lowest overall score (points against) is the winner. The first bus roadeo in Australia was held by the NSW Omnibus Proprietors' Association at their convention at Lismore, NSW in May 1954. Over two days, 41 drivers in three classes of buses competed in this state-level event. 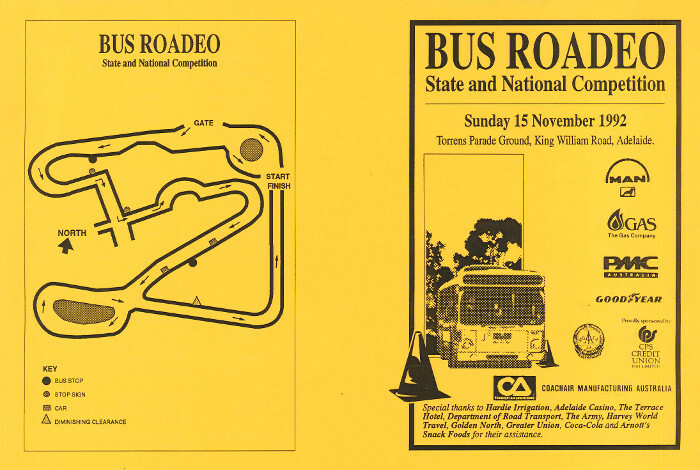 The State Transport Authority of South Australia hosted the first National Bus Roadeo in October 1991 in Adelaide. 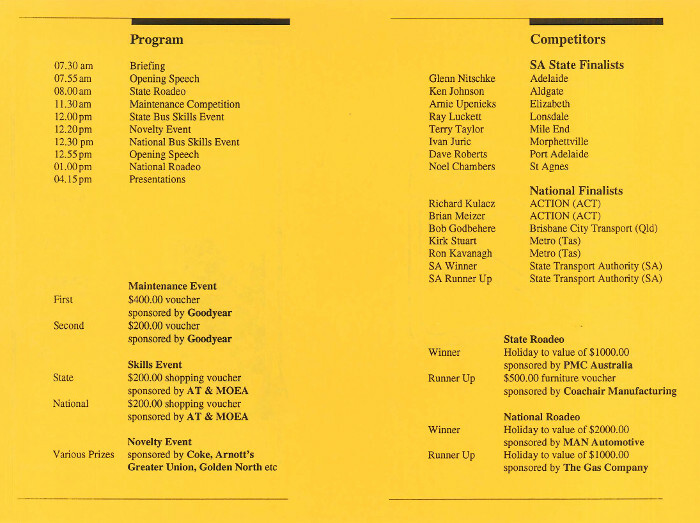 ACTION drivers Richard Kulacz and John Bohle won the right to compete after taking out the ACTION Bus Rodeo in August 1991. Richard Kulacz was also victorious in the 1991 National Bus Rodeo. 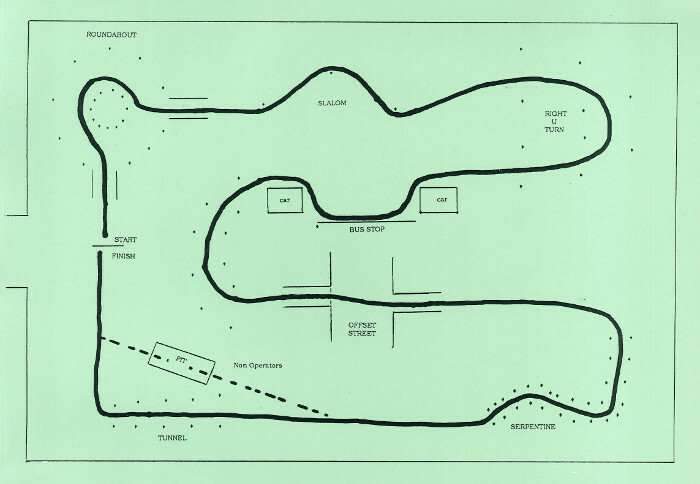 ACTION made two major changes for its local qualifiying event in 1992. 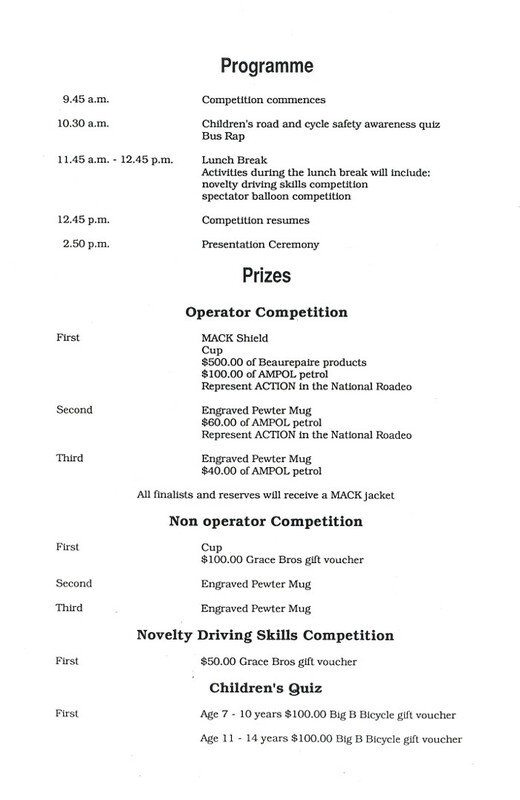 The event became the ACTION MACK Bus Roadeo when Mack Trucks became the main sponsor. At the time, MACK supplied the Renault PR100.2 and PR100.3 buses used by ACTION. The other change was to move the event from its 1991 venue, in a Philip car park, to the Driver Training Centre at Sutton. 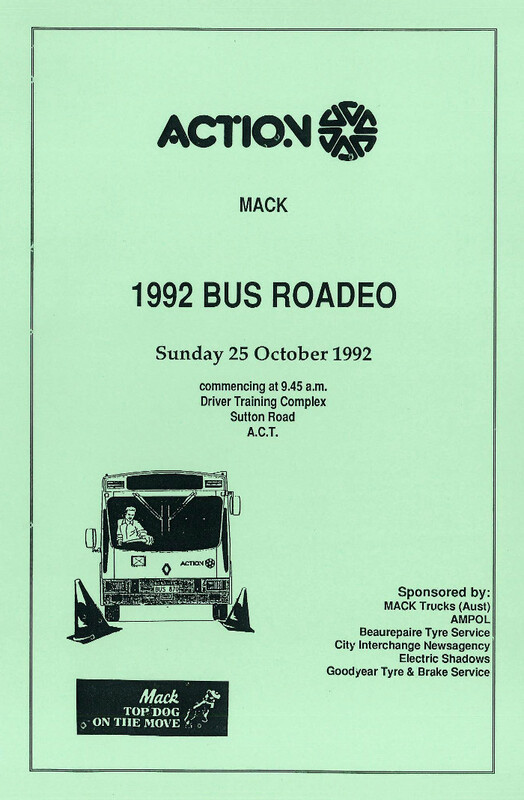 Held on Sunday 25 October, the 1992 ACTION MACK Bus Roadeo was a family event, including novelty driving skills and spectator water balloon throwing competitions. 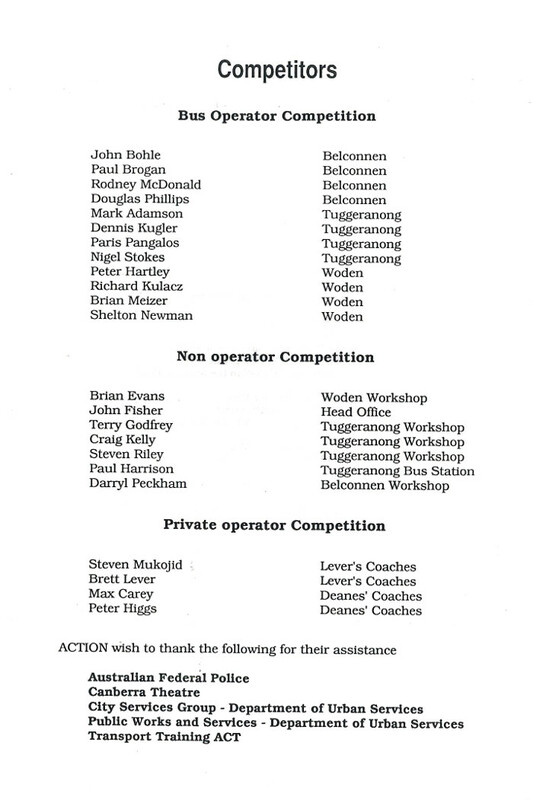 Entrants in the novelty driving skills were "non operator" staff from ACTION offices and workshops. Using only the front left tyre of a bus, drivers were required to burst five balloons. The award for "demonstrating a very consistent round and missing every balloon" went to John Fisher from Head Office. The kids had the chance to compete in two road safety quizzes for ages 7 to 10 and 11 to 14. Quiz winners each received a $100 gift voucher for Big B Bicycles! You can test you own knowledge of Canberra's road rules c1990s by downloading the two quizzes here ( PDF 600Kb). You will find the answers here ( PDF 568Kb) (no cheating). 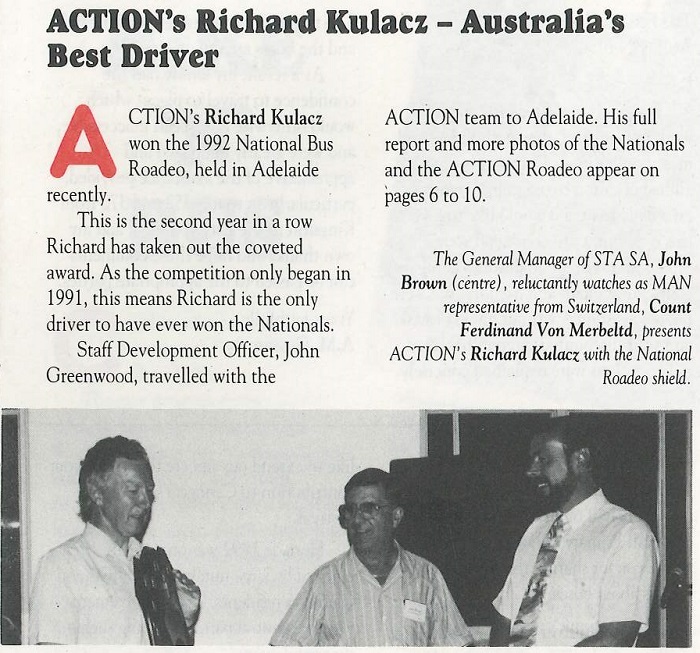 Richard Kulacz was once again victorious and with runner up Brian Meizer, they would represent ACTION in the following month's 1992 National Bus Roadeo. Both drivers flew to Adelaide for the National Bus Roadeo. It was left to the support crew to drive ACTION's other representative, 'Bus 690', to Adelaide. The journey was not entirely problem free. When they arrived in Adelaide, the team fixed an unspecified mechanical problem that Bus 690 encountered on route. ACTION's Staff Development Officer John Greenwood reported that Bus 690 also caused a "shock" on its arrival at the roadeo. Bus 690 was now sporting the "all over MACK" livery rather than the expected orange and blue ACTION colours it carried the previous year. The December 1992 issue of ACTION's newsletter 'Trans ACTION' reported that, "The Roadeo course was very, very, very tight but not impossible. After the first round a Hobart entrant, Kirk Stuart was four points ahead of the champ. Richard's second round was devastating and produced the best show of the competition with only 39 penalty points incurred. The tension remained till the very end of the competition because Kirk, who had done so well in the first round, was last to compete." ACTION's Richard Kulzac successfully defended his title with Kirk Stuart and Ray Luckett from Adelaide runners up.